For his detractors, it may not be as satisfying as watching him getting slapped, but there is a video where Max Landis spends two and a half minutes writhing in pain. 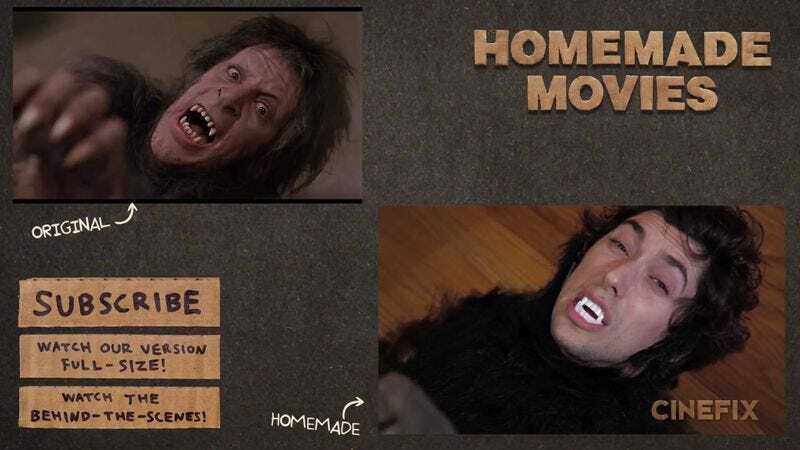 Landis stars in a reenactment of the famous transformation scene from An American Werewolf In London for the Cinefix YouTube series “Homemade.” The original scene, directed by Max’s father John Landis, featured cutting edge makeup and prosthetics by Rick Baker and is roundly held as one of the most impressive effects sequences in the modern era. This version, directed by Travis Betz, utilizes a lot of modeling clay and a wolf puppet. But those smaller scale elements add charm to Betz’s version, while adhering fit to the rules of “Homemade” which state that it must copy the original film shot for shot and everything must be done in camera. Betz is able to time and frame everything pretty much perfectly, as can be seen in this comparison video, while Landis acquits himself nicely in the David Naughton role of screaming and agonizing on the floor. This recreation shows a real devotion to the original, something that will never be said for An American Werewolf In Paris.